3. 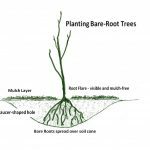 Much also feeds microbial organisms and other living creatures in the top soil which, in turn, release nutrients into the soil, making them available to the tree. 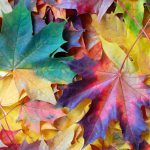 This will make your leaves greener and increase the rate of healthy tree growth. 4. It suppresses grass and weed growth underneath the tree which can compete with the trees for nutrients and water. 5. It is also an effective way to keep lawn-mowers away from damaging the tree’s bark. For well-established tree, if you have well-rotted household and garden waste compost, mix in nitrogen-rich material such as chicken manure and watch your trees flourish. 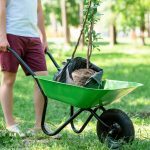 For newly-planted trees you can do the same except hold the nitrogen-rich additions until at least 1 year after planting. Larger trees older than 10 years can do with less mulching as smaller trees but can still benefit. When laying down your mulch, take care not to cover the base of the tree trunk where it begins to flare into the root system. It’s very important that this root collar remains exposed to the air. We also suggest a maximum mulch thickness of no more than three inches. Spread it as far as the drip line of the trees i.e. to the edge of the lower branches which signifies the breadth of the underlying root system. Mulching is long-acting and great for desert and less dry climates alike. But if mulching materials are not readily available, you can use slow-release fertilizer around the tree roots instead. March is a good month for fertilization because the sol is beginning to warm. This awakens the microbial life within the soil which will become even more active having been fed. This, in turn, improves the overall health of the soil in the vicinity of your tree. Inspect your trees – Examine your tree’s branches and trunk for any clusters of insect eggs, any remaining winter damage (not pruned off in February) and scale and other indicators of disease. Also check for any small round holes indicating borer activity. Wood particles at the base of the tree could indicate the same. And check for aphid activity on tree buds that will become visible in March. 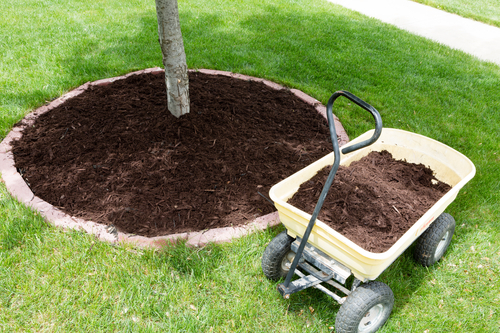 Fertilizing – If you do not have a mulching program underway, March is a great month to fertilize your trees instead as described above. If applied on a number of trees, it will be worthwhile getting a soil tester kit to see which minerals are deficient in your soil and, therefore, the most appropriate compound to apply. Finish pruning deciduous trees – Even though you really should have finished pruning any fruit trees by now, you can still prune your other deciduous trees in most states at the beginning of March – see February’s Diary for details. 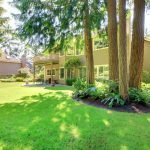 Pruning evergreen trees and flowering trees – March is also a great month for pruning most evergreen trees and for trimming flowering trees. For flowering varieties of trees that bloom on growth from last year, prune promptly as quickly as possible after flowering ends. For flowering trees that bloom on new growth, prune the tree towards the end of winter or at the beginning of spring. – You didn’t get round to pruning your trees in February and you would like help trimming them. – You have observed insect pests on or around your tree (see ‘Inspect your Trees – above) and believe you would like advice or help with application an appropriate insecticide. – You want professional soil testing conducted by our arborists with a view to fertilization of your trees.